﻿ The Many Seasons Of The Cold Seas Are Not What They Seem. This fjord is known in this region for water clarity. 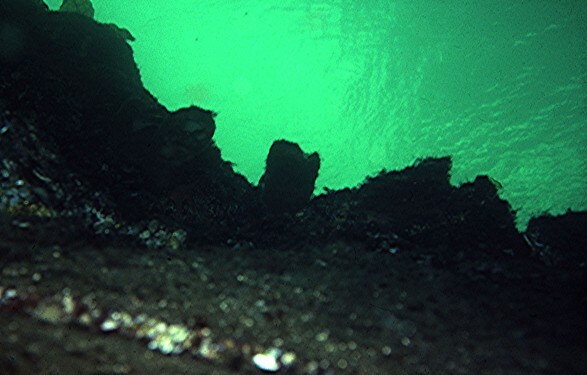 Picture was taken at 27m, aiming toward the surface. As I write this, it is the vernal equinox, the so-called, “first day of spring,” or around here, in South-Central Montana, right now in 2014, it would be better termed one of the later days of winter. In the areas of the Salish Sea or Puget Sound, the seasonal dance is well under way. Subtidally, winter ended about a month ago, and right now, changes are occurring with great rapidity. The oceanic realm of this region has seasons, but they only loosely match those seen on shore. 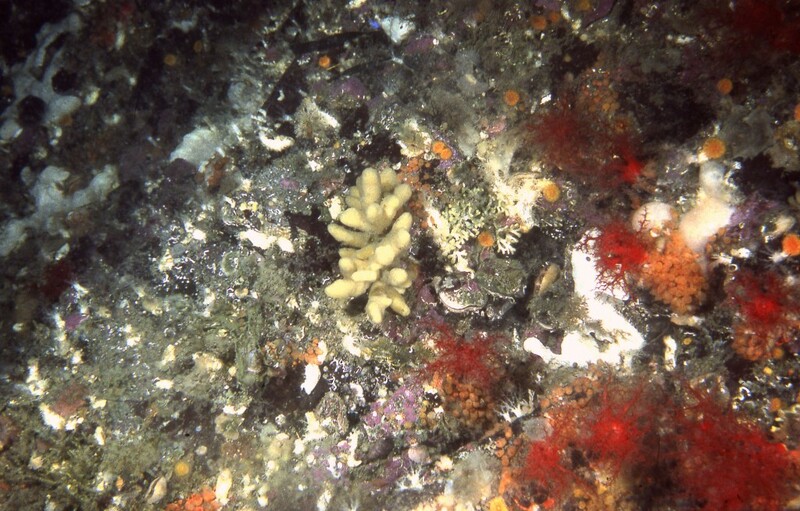 The careful observer will find that the animals and habitats of the subtidal Puget Sound Region certainly react differently to these definite and easily demarked seasons, in stark contrast to what is seen in the waters of the tropics. An aquarist who attempts to keep such animals must be aware of the difference and accommodate the animals. What I term the seasons of the marine shallow subtidal habitats in this part of the Pacific Northwest region, basically the shallow waters of Northern Washington, British Columbia, and Southeastern Alaska, bear only a passing resemblance to the seasons likely to be encountered above the waterline (Table 1). As with the terrestrial environment, the primary driver of seasonality is sunlight; but here sunlight’s effects come in pure and in modified forms. The rest of the time, sunlight is filtered and muted through clouds. While solar illumination is, of course, the ultimate driver for the region’s weather, both direct illumination and secondary weather events working together result in the overall marine environment of the entire region exhibiting remarkably stable physical conditions. Temperature fluctuations below 16.5 feet (5 m) are minor, seldom varying by more than a couple of Celsius degrees, and generally no more than about 6 or 7 Fahrenheit degrees. Shallow water salinity fluctuates much more drastically due to the runoff due to rainfall and snowmelt, but even so, deeper areas, below 10 m (33 feet) remain stable. Freshwater layers due to major runoff events such as the more-or-less continuous winter rainfall and episodic floods tend to flow out on top of and over the underlying layers which are more stable, more dense, and highly saline. This is not to say there are no effects due to these factors, but major salinity and temperature effects are abnormal, variable in extent and degree, and relatively unpredictable. Table 1. Subtidal Seasons Of The Salish Sea; That Inland Marine Region Centered On The Northern San Juan Islands Of Washington. Dark Mid-October Mid-February Low Illumination,Temperature Clear Water No Plankton; “Everything Is Shut Down”No Suspension-Feeders Feeding. Second Plankton Late-March Late – May As Above Water Clarity Increases Slightly, Water Color Changes From Green To Aquamarine; Zooplankton Bloom Becomes Noticeable; Phytoplankton Presence Is Less, Spawning Is Occurring With Some Benthos, Benthic Diatom Cover Is Reduced, Benthic Herbivores Are Common. Shutdown Early October Mid to LateOctober Temperature Drops, Illumination Drops, Rains Begin. Water Clears Up, Becomes Dark Green. Plankton Disappears, Filter-Feeders Shut Down. Diatoms On Benthos Gone. This peculiar arrangement of “seasons” means that some of the animals will not be feeding during the clear water periods of the winter. Maintaining these animals in aquarium takes care. The animals will appear quiescent, even dead, and yet they will be absolutely fine, and once the plankton bloom returns along with the warming of water in the early spring they will come out of the sediments and begin to feed once again. Orange and red frilly structures to the right are the feeding crowns of sea cucumbers. Habitat is a vertical rock wall at a depth of 12 m.
This is a vertical rock wall in the same habitat as above, but about 3 m deeper, and a couple of months later. There are sea cucumbers present, but they will not be feeding again for another 3 months. 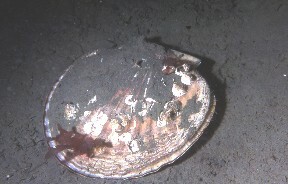 This large scallop is found in a soft-sediment area. Note all the small white sea cucumbers surrounding the scallop. The image was take in July, when there is a rich plankton bloom in the water. 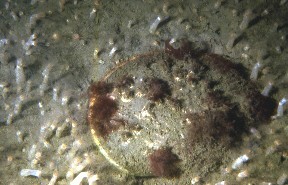 A similar scallop as is shown above, but the image was taken in December, and while all the sea cucumbers are present, they are buried in sediment not feeding until the plankton bloom returns. Over the next several posts, I will be returning to the seasonal differences in animal husbandry. As will become apparent, this is a particularly important part of the care of the many filter feeders in this region. Very interesting Dr. Ron! I have always been wondering about this in my local area, NE Atlantic. It seems very similar here. I would expect something similar in any cold seas. As with all patterns like this, it will have to be looked for to be seen, and that will take a lot of diving research to verify. I doubt it could described it total with surface sampling or with ROVs. Unfortunately, the kind of long term project that I did (or more accurately, the sequence of many shorter-termed projects I was able to participate in) is very uncommon. So, unless somebody specifically looks this type of seasonality, it is unlikely to be seen, and the animal behavior resulting from it will be continuously misdescribed and poorly understood. A fascinating topic that we have noted often at the Feiro Center in Port Angeles. A lot of mollusks have what appear to be growth rings on/in their shells; one wonders how this multitude of seasons would affect the interpretation of these rings – especially with suspension feeders which have been shown to eat certain types of phytoplankton while rejecting others. The interpretation of growth rings is dicey in any case, and really has to examined with a lot of caveats. With some intertidal clams, a ring is deposited every time the animal is submerged (including at certain tidal times, every time a wave breaks so that water covers the beastie for a very brief period)- this makes for hundreds to thousands of bands, depending on the microscopy used. 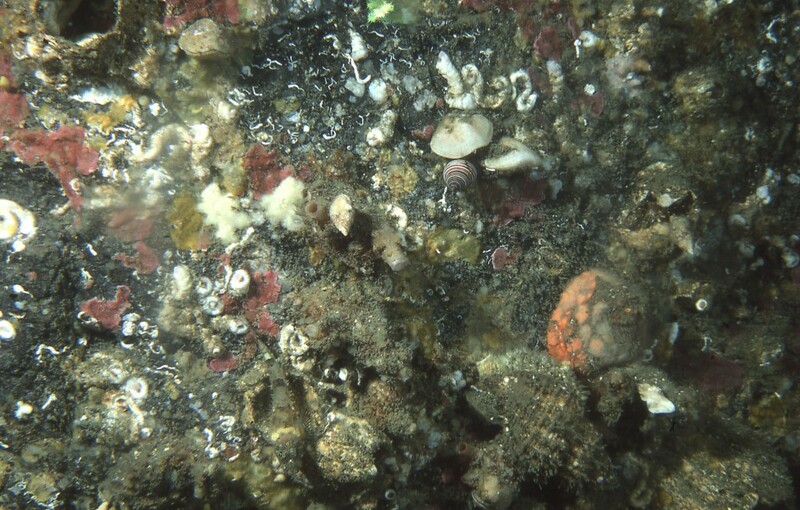 It would be very interesting to compare the deposition of shell material by various clams – of different phylogenies, and ecologies – mussels, venerids, protobranchs, etc., with the variables of depth and date. I suspect in some regards, the seasonality that I described devolves to a different seasonality as the depth decreases and may be a more “normal” four seasons in the intertidal. Or maybe not, maybe the intertidal is its own world.